Last night I made a simple meal: a side dish (or it could be a vegetarian entree) from Cooking Light (Jan/Feb 2012) and Cod simply cooked in the oven with some salt and pepper. I have been a little under the weather the past couple days, and I wanted something easy to prepare that tasted good. My go to meal is pan searing fish and finishing it in the oven, and making a side or salad of some sort. Doesn’t get easier than that! 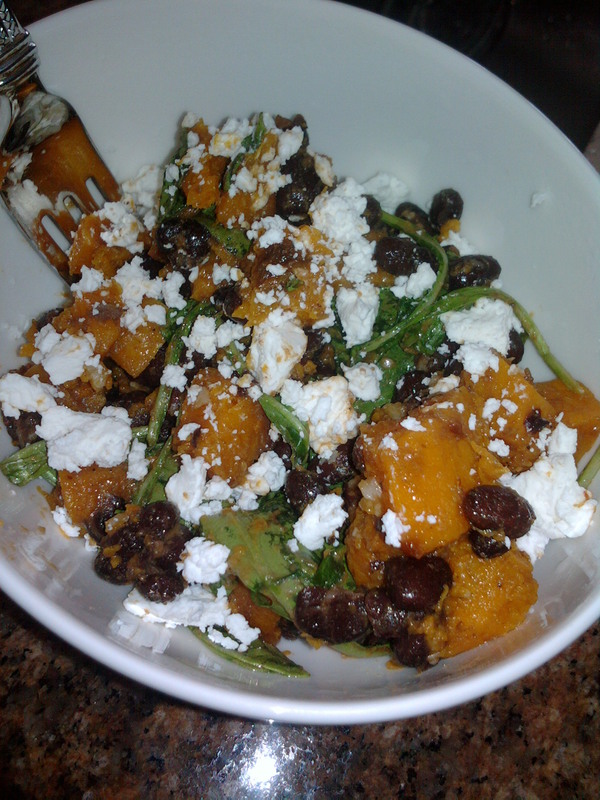 I was really impressed with the Cooking Light recipe, Butternut Squash and Smokey Black Bean Salad, so I thought I’d share it with everyone. I hadn’t intended on mentioning this recipe, so the photograph is the leftover I had for lunch today. I went a little crazy with the goat cheese. Oops! I hope you enjoy this as much as Franz and I did! I Put a Little Too Much Goat Cheese on It Today For Lunch! Oops! 2. Combine squash and 1 tablespoon oil; toss to coat. Arrange squash on a baking sheet. Bake for 25 minutes or until tender. 3. For the walnuts, place them in the toaster oven, if you have one, until they become fragrant. Depending on your toaster oven, it can take a few minutes or longer. Keep an eye on it. Remember that the walnuts will cook another minute or 2 after you take them out. Cooking Light suggests placing the nuts on a baking sheet, coat them in cooking spray, sprinkle with salt, and bake at 425 degrees for 10 minutes, stirring once. I think my way is easier & tastes just as good. 4. Combine 1 tablespoon olive oil, vinegar, mustard, honey, and adobo sauce in a bowl; stir with a whisk. 5. Heat a medium nonstick skillet over medium heat. (I used my stock pot for this because my skillet wouldn’t be deep enough, and I like extra room to work.) Add remaining 1 teaspoon oil to pan; swirl to coat. Add garlic; sauté 1 minute. Add squash, remaining 3/8 teaspoon salt (I just eye balled it), pepper, and beans; cook 3 minutes or until heated through. Remove from heat; stir in 3 tablespoons adobo dressing; toss to coat. 6. At this point, I deviated a little from the recipe. At this point, I put the arugula into the squash mixture and added the remaining dressing. I gently folded everything together. The recipe calls for you to put the remaining dressing on the arugula & toss. The squash mixture is placed on top of the arugula. I like my salad ingredients mixed together. We call that a “gamish” in this house. Once it’s plated, add a little goat cheese on top – however much you like.